Home / GOOGLE / sophie taeuber-arp / Sophie Taeuber-Arp in Google Today! Sophie Taeuber-Arp (/ˈtɔɪbər ˈɑːrp/; 19 January 1889 - 13 January 1943) was a Swiss artist, painter, sculptor, anddancer. She is considered one of the most important artists of geometric abstraction of the 20th century. Taeuber-Arp is the only woman on the current series of Swiss banknotes in Switzerland; her portrait has been on the 50-franc note since 1995. A museum honoring Taeuber-Arp and Jean Arp opened in 2007 in a section of the Rolandseck, Germany, train station redesigned by Richard Meier. 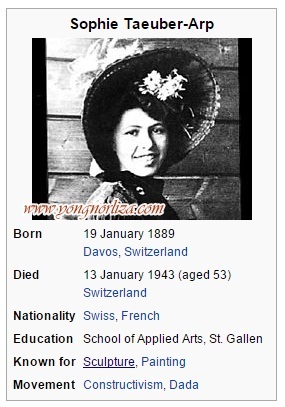 The Swiss artist would have celebrated her 127th birthday today and is being honoured by the search engine.Sophie Taeuber-Arp was created by artist Mark Holmes.